McIlroy alongside former stablemate Lee Wetwood earlier this week.Caroline Wozniacki is expected in China to watch boyfriend Rory McIlroy try and clinch what would be the most lucrative pay-day of his career in the Lake Malaren Shanghai Masters on Sunday. The US Open champion and world No 3 fired a bogey-free 65 to take a three stroke lead into the final round of a 30-man invitational offering appearance money for all, a $5m purse and a cool $2m for the winner. Click to enlarge.If the 22-year old Co Down man manages to win with the 54-hole lead for the third time from six attempts - he won the 2009 Dubai Desert Classic and this year’s US Open with the final round lead - he will have made the best possible start to his career under new management group Horizon Sports. He is also guaranteed a hug on the 18th green with women’s tennis No 1 Wozniacki expected to watch the final round action. While he missed several putts, McIlroy still made seven birdies to lead by three shots from American Anthony Kim (65) on 18-under with Padraig Harrington 12 shots behind after a 73 saw him slip back to tied eighth. A pensive looking Padraig Harrington in Shanghai.“I set myself a target of hitting 18 under today so that’s what I did. I’ve got a three-shot lead which is fantastic,” McIlroy told AFP. Korean Noh Seung-Yul shot a 67 and lie in third on 14 under with Ian Poulter and Hunter Mahan seven adrift in fourth on 11 under. Lee Westwood had just three birdies in a 70 and shares sixth with Australian Geoff Ogilvy on seven under. Unsactioned by any tour and therefore bereft of world ranking points, the event has been criticised as a money grab for the elite and a vanity tournament that does little to grow the game in Asia. Chinese property tycoon Shi Jian has stumped up the $5 million purse for the tournament and splashed out millions more on revamping the five-star 72-hole golf resort to major event standard. The huge cash prize at the unsanctioned tournament has raised eyebrows in the golfing establishment — many critical. McIlroy sought to defend critics waiting to pounce on elite players taking advantage of the boom in extravagant exhibition showcases in cash-rich China as the rest of the world tightens its belt. “As golfers we are very fortunate to play for such large amounts of money. We all count ourselves as quite fortunate because of the way the world is at the moment, with a lot of people struggling,” he said. The five-star resort features a tennis centre and the owner hopes to see Wozniacki make use of it during here stay. “Caroline is arriving to cheer Rory on. We have readied the tennis centre at our golf resort because we’ve been told she likes to practise every day,” tournament owner Janson Shi told AFP. The Danish tennis ace will add some extra stardust from an executive box on the 18th as she watches her boyfriend attempt to pocket the biggest cheque of his career. Images courtesy of the Lake Malaren tournament blog. Rory McIlroy has a two-stroke lead at the halfway stage of the unofficial Shanghai Masters at Lake Malaren where he has a chance to pocket the biggest cheque of his short career in his first week under new management. However, the Chinese sponsor hold off on making out the $2m cheque to McIlroy just yet, given that his strike rate from Friday leader to Sunday champion is just 25%. Four months after his US Open triumph, Rory McIlroy poses with his second trophy of the year.It was a victory worth $2m but for Rory McIlroy, his fourth professional triumph in the unofficial Lake Malaren Shanghai Masters was priceless. Leaving aside the future financial well-being for his newly forged relationship with Horizon Sports Management - (the agency that didn’t poach the goose that lays the golden eggs?) - the 22-year old US Open champion’s win over American Anthony Kim at the first extra hole of a sudden-death play-off will stand to him when there is more on the line that mere money. 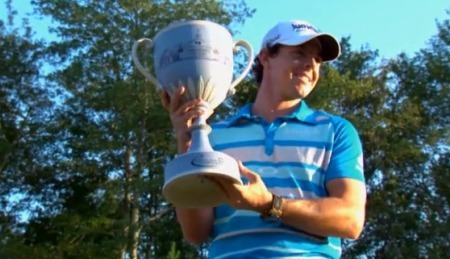 Rory McIlroy with the US Open trophy. Picture/www.golffile.ieWhile there’s still no news on why Rory McIlroy suddenly dropped his social networking connections with Lee Westwood and Chubby Chandler, the world No 3 insisted in Shanghai that his split with ISM had nothing to do with money and everything to do with winning more silverware. Rory McIlroy has won two majors and three regular PGA Tour events in the USSix-million dollar man Rory McIlroy hailed a watching Caroline Wozniacki as his Wonder Woman after snatching his third win of the year and his second in just three weeks.